As Valentine's Day approaches, some of us may be tempted to try our hand at a good old fashioned "Lonely Heart" ad, however those who do try to find love through the papers would be advised to take caution. Aberdeen Journal - Monday 07 March 1949© THE BRITISH LIBRARY BOARD. ALL RIGHTS RESERVED. 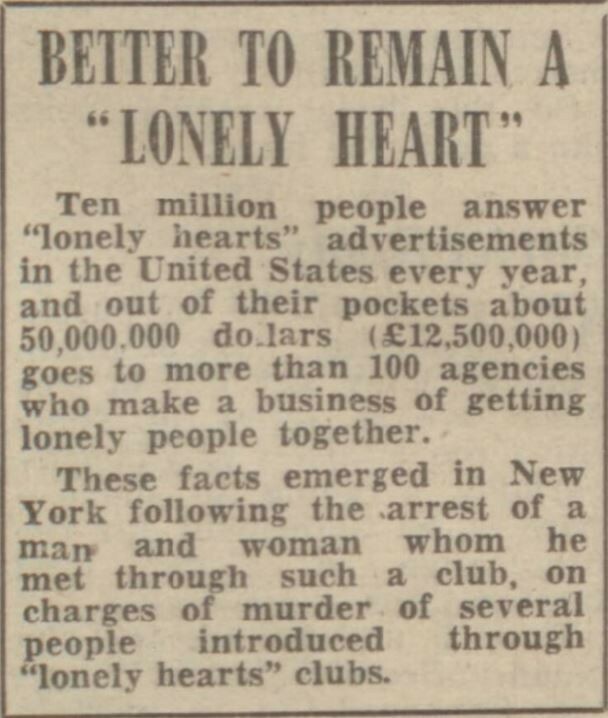 Unfortunately, the famous Lonely Hearts murders in New York were not an isolated incident. William Sanchez d'Epina Hepper was born in Gibraltar in 1891. He spent most of his life living in London, working as a clerk for the BBC and allegedly spying for the United States. He appears in 1939 in the Passenger Lists Leaving UK 1890-1960 records as having departed Southampton for Lisbon on board the Almanzora. The consular secretary travels alone in second class, noting his "country of intended future residence" down as Portugal. But one year later he was back in London, living with his wife, Patrocinio S Hepper. Patrocinio is a common name in Portugal, so it's possible that they met the year before. Looking further down his 1939 Register record you can see that he lived just around the corner from Percy Baker, a police constable. 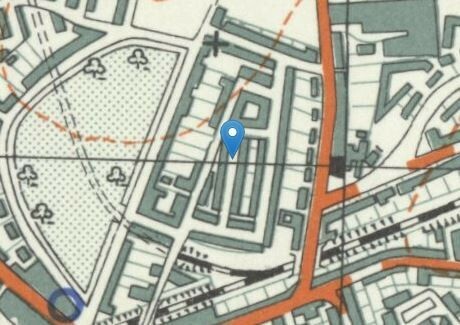 The Islington street where Hepper lived, from his 1939 Register record. Constable Baker lived near the black cross. 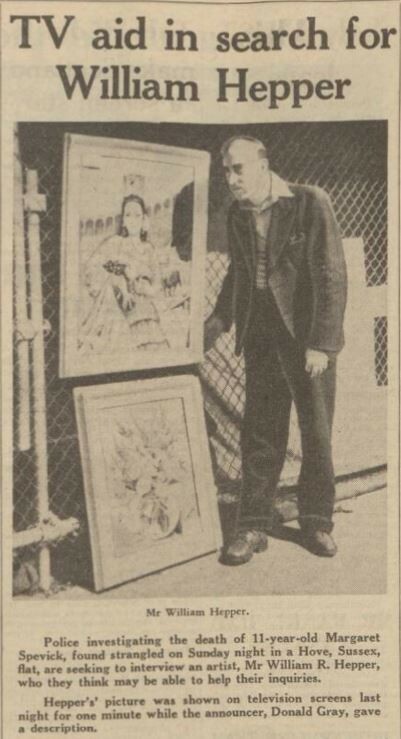 In 1954, Hepper killed one of his daughter's friends, 11-year-old Margaret Spevick, who went to his Brighton studio to sit as a model for one of his paintings. 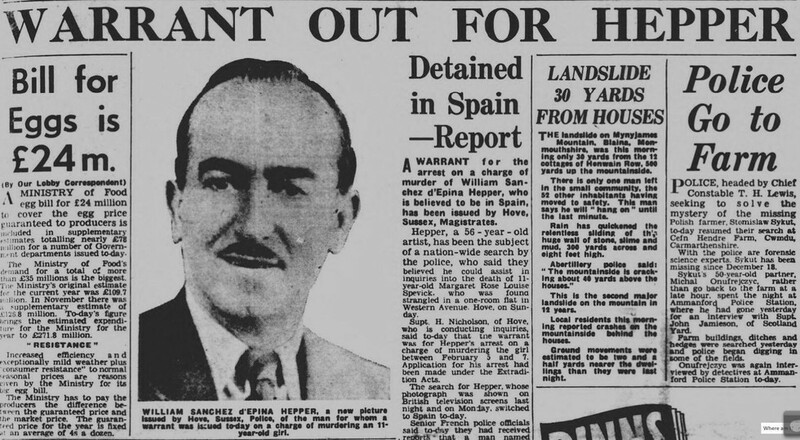 Hepper went on the run, sparking a nationwide search and one of the first televised public appeals. Dundee Courier - Tuesday 09 February 1954© THE BRITISH LIBRARY BOARD. ALL RIGHTS RESERVED. The police interviewed a number of women from a Lonely Hearts club, with whom Hepper had been in correspondence. "I have never seen Mr Hepper and he only wrote to me by means of my nom de plume. But I am proud to say I admired him," one woman said, in the Sunderland Daily Echo and Shipping Gazettte, 10 February 1954. "I am sure that he must be suffering from something like a 'black-out' or he would have come forward by now." Sunderland Daily Echo and Shipping Gazette - Wednesday 10 February 1954© THE BRITISH LIBRARY BOARD. ALL RIGHTS RESERVED. Hepper was tracked down in a boarding-house on the Spanish border on the day that newspaper was published. The Aberdeen Evening Express reported on the 21 July 1954 that during his trial, Hepper collapsed and pleaded insanity. He claimed that he was distraught to find out that his wife had been a prostitute before they had married, and the discovery had led to his mental demise. He was, he stated, "suffering the cruellest moral tortures that a man can suffer". Aberdeen Evening Express - Wednesday 21 July 1954© THE BRITISH LIBRARY BOARD. ALL RIGHTS RESERVED. "I feel as if I had been stabbed in the heart. With such a background how can you doctors expect my health to improve?" One Dr Gainsborough was asked if he believed the accusations in the letter, to which he replied "No. I thought they were all nonsense." The doctor resolved that while Hepper did display some obsessional tendencies, he believed he was in "a paranoiac state" and not "certifiably insane." Hepper was executed at Wandsworth prison on the 11 August 1954, as seen in the England and Wales Deaths 1837-2007 records.